Die Operations Sturm, stand unter dem Kommando der US Generäle, welche die Ethnischen Säuberungen organisierten unter der Söldner Kolonne der MPRI, welche dann von Blackwater aufgekauft wurde. Internationales Verbrechen in Tradition der Amerikaner. Die UN Banden als Partner, versuchten nur die Canadier damals das Morden und Massakrieren zustoppen und in Bonn damals: das grosse Schweigen wie immer bei Verbrechen der Amerikaner. 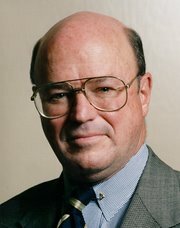 Die CIA Operation ROOTs, wo man mit Morden, Millionen $, Anschlägen Hass im Balkan säen wollte, was der CIA Offizier Robert Baer in vielen Details outete, ebenso Britische SAS Offiziere. An NGO’s criminal complaint accusing unknown perpetrators of committing war crimes during the Croatian military’s Operation Storm, whose 22nd anniversary is marked this weekend, highlights the lack of prosecutions so far. Ruins of a house in Grubori burned during the war; photo taken in 2014. Photo courtesy of Marko Sjekavica. Zagreb-based NGO Documenta – Centre for Dealing with the Past filed a criminal complaint to the Croatian state attorney’s office on Friday over war crimes committed during and after the victorious military Operation Storm in August 1995. Documenta filed the complaint against unknown direct perpetrators who shot and killed ten mostly elderly Serb civilians in the village of Uzdolje and the surrounding hamlets, near the Croatian town of Knin. While researching human losses during Croatia’s 1990s war, Documenta’s researchers talked to witnesses who told them about the killings there on August 6, 1995. On August 5 and 8, soldiers also burned houses in these villages, Documenta was told. According to witnesses who gave statements to Documenta, one Croatian soldier opened fire in Uzdolje, killing Milica Sare, Stevo Beric, Janja Beric, Djudjija Beric, Krsto Sare, Milos Cosic and Jandrija Sara, who were all between 62 and 79 years of age. Soldiers also killed 73-year-old Sava Sare on her porch afterwards. In the nearby hamlet of Vrbnik, unknown Croatian soldiers also killed 61- or 62-year-old Lazo Damjanic and 28-year-old Predrag Zaric. During Operation Storm, Croatian forces regained territory controlled since late 1991 by rebel Croatian Serbs, who had been helped by the Yugoslav People’s Army and Serbian paramilitaries. As well as committing large-scale crimes against Croats, the rebel Serb authorities expelled between 200,000 and 250,000 non-Serbs from their unrecognised wartime statelet, the Republic of Serbian Krajina. After peace talks failed, Croatian special police units and army troops crushed the rebel Serb fighters between August 4 and 7, 1995, and retook all of their territories except ones in eastern Croatia. The operation led to a humanitarian crisis, as up to 200,000 Serb civilians left Croatia during and after the operation. The UN refugee agency estimates that in 1995, a total of around 250,000 Serbs left Croatia. Croatian forces and unknown perpetrators also killed a number of Serb civilians during and after the operation. Before this, Zaric was allegedly imprisoned by rebel Serbs in Knin for a while after he refused to serve in their armed forces. He is said to have had a certificate proving he that refused to fight for the rebel Serb authorities, but he was killed anyway. “We’re filing this against unknown perpetrators, although witnesses detected some things in their statements. Three [perpetrators] have been identified who were wearing uniforms and were in direct contact with their superiors from certain units of the Croatian Army,” Eugen Jakovcic from Documenta told BIRN. Jakovcic explained that Documenta’s aim was to show that “facts [about crimes] exist” that only need to be processed by the legal authorities. The prosecution at the International Criminal Tribunal for the Former Yugoslavia included seven Serb civilians who were shot in Uzdolje in its case against Croatian generals Ante Gotovina, Mladen Markac and Ivan Cermak. The trial chamber acquitted Cermak in April 2011 and the appeals chamber acquitted Gotovina and Markac in November 2012. The Croatian Helsinki Committee for Human Rights has accounted for 677 victims of Operation Storm. But the state attorney’s office said in 2012 that there were 27 war crimes committed against 167 people. Of this number, unknown perpetrators committed 24 of the crimes, involving 155 victims. Responding to BIRN’s inquiry about the possibility that those numbers could now be higher, the state attorney’s office said that due to the “ongoing development of the informatics system” used for its war crimes data, it “cannot give precise information on the number of war crimes committed by unknown perpetrators”. Regarding crimes committed by known perpetrators, it stated that a total of five investigations against 11 perpetrators have been launched, along with four indictments against seven persons. UN footage of Grubori after the crime was committed. In the Gotovina case, the Hague Tribunal concluded that Operation Storm caused the deaths of 44 civilian victims. Meanwhile the Croatian judiciary has prosecuted only a fraction of war crimes committed during and after Storm. In May 2014, the Supreme Court in Zagreb issued the only conviction for war crimes committed by Croatian forces during the operation. Bozo Bacelic, a former platoon commander in the reconnaissance company of the 113th brigade of Croatian Army, was sentenced to seven years for killing a couple, Nikola and Milica Damjanic, aged 76 and 74, on August 11, 1995, in front of their house on Lake Prokljan. The Supreme Court also found him guilty of killing a captured Serb soldier, Vuk Mandic, in the hamlet of Mandici, some 40 kilometres from Prokljan, on August 9 or 10. Bacelic initially ordered his subordinates – Ante Mamic, Luka Vuko and Jurica Ravlic – to shoot the Damjanics, but they did not, so he shot them himself. After two retrials, the Supreme Court acquitted Mamic, Vuko and Ravlic in March 2016, while earlier courts established that the fact that they helped the killer had fallen under the statute of limitations. Inside of a burned house in Grubori; photo taken in 2014. Photo courtesy of Marko Sjekavica. There are still two ongoing cases for Storm crimes before Croatian courts. Rajko Krickovic, a former member of the 118th home guard regiment of the Croatian Army, is being tried for shooting a brother and sister, 43-year-old Radomir Sovilj and 45-year-old Mira Sovilj, and setting their house on fire with their 73-year-old mother Mara Sovilj inside. The crime was committed between August 15 and 28 in the village of Kijani, near Gracac in the central Lika region, which was also where Krickovic was born. Allegedly Krickovic committed the crimes to revenge several of his comrades who died in Operation Storm. The trial started at Rijeka county court in January this year, and Krickovic pleaded not guilty. he United States not only monitored the complete Operation Storm, but they also actively participated with the Croatian Military in its preparation, and in the end directly initiated the operation. The green light from the White House and then President Clinton for Operation Storm was passed on by Colonel Richard C. Herrick, then US military attaché in Zagreb. Several days prior to the commencement of Operation Storm, Herrick visited Markica Rebić in Zagreb. 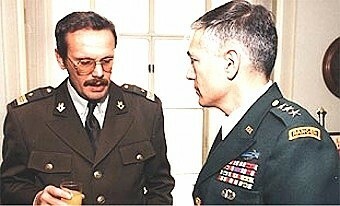 Rebić, Miroslav Tuđman, then director of HIS and Miro Međimurac, then head of SIS, held the most intensive communications with the American military and intelligence agencies. 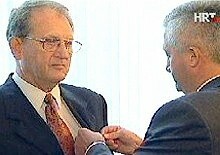 As such, in 1996, Markica Rebić was awarded the Meritorius Service Medal by Peter Galbraith, then US Ambassador to Croatia. Herrick passed on the message that the US had no opposition to the beginning of Operation Storm, that the operation had to be ‚clean and fast‘ and had to be completed in 5 days time. As Nacional has learned, Rebić was surprised that such an important political and military message would be passed on through those channels, and following Herrick’s visit, he immediately informed the state administration of the message in writing, and there is certain record of this today in the archives. As such, it is important to note the Ambassador Peter Galbraith was completely left out of the chain of ‚command‘, and that this message came directly from President Clinton, Anthony Lake (then National Security Advisor) and William Perry (then Defense Secretary) via Rebić to Minister Gojko Šušak and President Tuđman. This was the climax of the cooperation between the US and Croatia, which began to develop in 1992 at the beginning of the Serbian-Muslim war. In 1995, Clinton was preparing for his re-election, and Bob Dole was the republic candidate who had requested that Congress remove the arms embargo for the Muslims in BiH. For Clinton, the Balkans became an important issue due to internal matters in the US and his stay in the White House. In their strategy to resolve the crisis, they decided to use Croatia to attack the Serbian forces in BiH, and therefore the Split Declaration was signed by Izetbegović and Tuđman, which permitted the entry of HV forces under the leadership of Ante Gotovina into BiH for the purposes of cooperation with Army BiH. In order to realize that operation, HV had to climb the Dinarid mountains above Knin and liberate the city and Krajina through Operation Storm, and then immediately transfer their troops into BiH in order to pressure the Serbs and force Milošević to sign the Peace Accord in Dayton.This was a battle against the clock for Clinton, for he needed a quick solution to the crisis in order to halt Dole’s initiative and to prove himself before his voters as a decisive president who could resolve such great crises such as the one in the former Yugoslavia, the horrors of which were shown daily on CNN and other American TV stations. In order to keep the English and French off his back, Clinton bypassed the classical diplomatic channels, in order to be able to claim that he had not participated if the operation were to go sour. However, considering that the operation, lead by Richard Holbrook on his behalf, ended successfully, but men emphasized their success in their respective books. The first contact at the highest intelligence levels began in 1992, when James Clapper was director of DIA (the Defense Intelligence Agency). His men in Croatia were Colonel Richard Herrick and his assistant Ivan Šarac. Šarac was a fourth order sergeant, the highest rank for a non-commissioned officer. Of Croatian descent, he emigrated to the US when he was 17 years old. After a few years, he enlisted in the army and was sent to Zagreb at the beginning of the war there as he was familiar with the circumstances and knew the language. Colonel Herrick was a construction engineer, however, over time he climbed the ladder in the American military and became one of Clapper’s most trusted men. Quickly a sort of ‚trade‘ between the two agencies began. Croatia gave DIA Russian 500 kg underwater mines and the most modern Russian torpedos as well as the cryptic codes used by the Yugoslav Army and the Russian army. These weapons were transferred to the US via the Split airport. When the transport was conducted, the entire airport was closed off. Hercules C-130s landed in the night, the arms were loaded and transferred to the US or one of their European bases under the greatest security measures. Also, the Croatian agency revealed the location of a chemical weapons factory in Bijelo polje near Mostar which the Serbs had transferred to Serbia. At least 16 UN observation posts were abandoned or captured. Dozens have been surrounded or mined by Croat troops. „We quite frankly do not know where all our soldiers are. 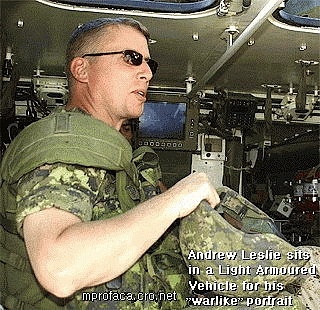 I believe the Croats are trying to intimidate us into abandoning our posts,“ said Col. Andrew Leslie, the UN military spokesman in Knin. President Clinton urged the Croats to be cautious and avoid spreading the conflict. Clinton said he had asked the Croats to „exercise real restraint because we are very concerned about a wider war“ resulting from the thrust aimed at taking back the breakaway Krajina region from rebel Croatian Serbs. Clinton said the Croat attacks had „apparently relieved a lot of pressure“ on the nearby Bihac enclave in Bosnia. An end to the Serb threat against the Bosnian Muslims in Bihac would mean the U.S. would not have to fulfill its promise to join NATO allies in air attacks to protect the enclave. Defense Secretary William Perry said the U.S. would not waver from its bedrock policy of keeping U.S. ground forces out of the former Yugoslavia. „Nothing happening there is going to cause us to go into this war,“ Perry said. Perry said the Croat offensive could „open a window of opportunity“ for an overall settlement by putting pressure on the Serbs. by Richard Sisk, Daily News Washington Bureau). 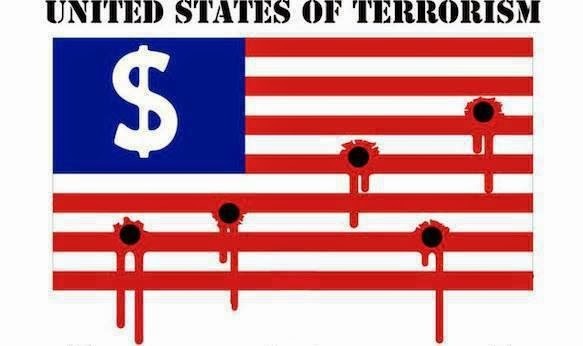 Aug 27, 2001U.S. envoy Richard Holbrooke referred to the Croatian army as his „junkyard dogs“ and acknowledges that the Croatian army was used to inflict substantial losses to the Milosevic-controlled Yugoslav army and shift momentum of the war. Croatian defense minister Pavao Miljavac (right) decorated MPRI executive director Major General Richard Griffits with the Order of the Croatian Clover in recognition of his contributions to helping Croatia create its own armed forces. On October 30, 1998 Croatian defense minister Pavao Miljavac and vicepresident of MPRI General Carl E. Vuono signed the Long-range management program (LRMP). This was a well covered factory which was unknown even to General Bienefeld, who was the greatest expert for chemical weapons in Croatia. With the help of samples found, the American experts were able to uncover all the types of toxins produced there which had possibly been sold to Iraq or other potential enemies of the US. This was only the beginning of cooperation, by which the US immediately delivered wiretapping equipment aimed at monitoring Serbia and Montenegro, a system which could simultaneously record 20,000 telephone conversations. This cooperation was conducted with the US NSA. 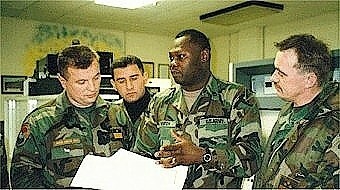 Prior to Storm, the operations Summer 94 and Summer 95 had to be carried out. 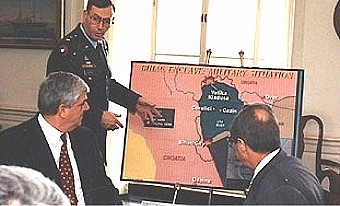 In planning the operations of bringing Croatian troops above Knin, the US assisted in the intelligence part of the operations. 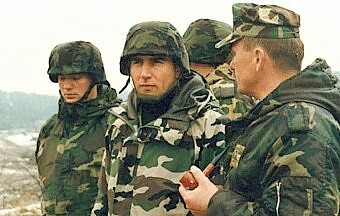 In order to precisely plan the penetration into the Bosnian mountains inland of Knin, much information was needed on the movement of Serbian troops, their communication system, codes and establishment of shelling points.Considering that the US was much more interested in the situation in BiH than in Croatia, they asked Croatia to permit them to install a military base with unmanned aircraft. The basic condition was that this be the best kept secret, so that it would not appear that the US had taken sides in this war. The island of Brac was selected, as it could be well protected. There all the equipment and personnel led by the CIA experts, with the long range unmanned aircraft which could cover the entire territory of BiH to the Serbian corridor on the Sava River. The entire Krajina region in Croatia was also in its range. At that time, no one had any idea what was going on and what was being hidden on the island of Brac. Nor did the US allies, the Germans have any idea. They sent their military attaché there on 1 January 1994. He hired a rent-a-car and drove the outer fence of the base and began taking pictures, thinking that the alertness in the base had faltered on New Year’s Day. However, he was quickly spotted by SIS and arrested. Only when he was brought into Gotovina for questioning was it learned that this was the German military attaché in Zagreb, Hans Schwan.After this incident, the entire base was transferred to Šepurina near Zadar, and a triple line of defense placed around it. Equipment was brought in from the US overnight, and from Šepurina, the unmanned aircraft could cover every corner of Krajina and BiH. The Americans had a silent agreement with HV to hand over all the photos of the terrain and the Serbian troops, while the images were transferred via satellite in real time to the Pentagon. Three US and three Croatian officers monitored the situation at all times.Prior to Operation Flash, which was supposed to serve as a dress rehearsal for Storm, at exactly midnight, six hours prior to the beginning of the operation, Herrick and Šarač were called into the police and were informed that the planned action would begin in a few hours time. In the Police Ministry, at exactly midnight, the staff of Operation Flash was formed, which was transferred to the Defense Ministry at 6 a.m. When the staff was moved, the American military attaché moved with it. He constantly requested updates and sent them directly to Clinton in the White House. Each morning, the American President was informed of the preparations and every part of the operation. The Americans were thrilled by the way Flash was carried out, they realized that this model of cooperation with the Croatians was ideal, and could be decisive in the battle against Milošević in BiH and could ultimately result in removing him from power. The Pentagon coordinated the entire action via Richard Herrick, and the CIA activities were coordinated by Marc Kelton, head of the CIA branch in Zagreb, who cooperated closely with Miroslav Tuđman, then head of HIS. At the time Storm was under preparation, the Americans supplied HV with intelligence on the movements of Serbs in Krajina and the movements of YNA on the eastern borders of Croatia. They feared that Milošević would launch a counter-attack with two tank brigades in eastern Slavonia if the Croats launched an attack on Knin. No American has been indicted for Croat pogrom of Serbs, and they should be: Croat general Ante Gotovina (indicted for war crimes, 2nd from the left) with his US military adviser on the eve of Operation Storm. At exactly midnight, they arrived at the operative staff and from there followed all the events in the field. This time, the entire Operation was transmitted in real time via satellite to the Pentagon, where these images remain archived today. ………. The US was thrilled with the how fast and clean the operation was conducted, and with its outcome, which permitted the lightning fast entry of HV into BiH and penetration all the way to Banja Luka and, finally, Belgrade’s consent to sign Dayton. The American control and satisfaction of the complete operation was later confirmed in the statements that the operation was carried out properly, and as such, the US-Croatian cooperation in intelligence and military matters intensified. General Colonel Patrick Hughes, Clapper’s successor as director of DIA, visited Croatia, intensified cooperation in the sector of electronic monitoring of Serbia and Montenegro, other intelligence was swapped, MPRI began its intensive training of the Croatian military and Rebić was decorated for his efforts. The first word that Croatian officers might have to stand trial for the events during Storm was heard in 1997. The US immediately responded and requested on a dozen occasions in discussions with the Hague Prosecutor that Storm, as a militarily clean operation, be left alone, as Nacional has learned from a high ranking diplomatic source. At that time, there was a problem concerning the extradition of Mladen Naletilić Tuta to the Hague, and the US promised Croatia that the Hague would not raise charges for Storm if they handed Naletilić over. Naletilić was extradited, and Carla Del Ponte outwitted the American administration and began with her demands that the Croatian generals be investigated as suspects in Storm. The US was dismayed but was not allowed to show this, trying to resolve the matter through quiet diplomacy instead, which to this day has not succeeded. Therefore it would be a step in the right direction for the Hague to request that the Pentagon hand over all the images recorded by the ‚Predator‘ unmanned aircraft during and after Storm. Furthermore, for the interests of truth, all of the high ranking American military and intelligence officers involved in the entire operation, which ended the war in the Balkans and removed Milošević from power, should be called to testify in the Hague. Those responsible for the crimes which took place after the operation are known, and they are the ones which should stand before the court, as they should have eight or nine years ago. Had these men been tried then, Carla Del Ponte today would have no aces up her sleeve, and Croatia would not have the problems is has, with the entire operation proclaimed a ‚criminal operation‘ and the entire state administration of the time a ‚criminal organization‘. Photos: Mario Profaca’s archiveA prominent supporter of Ante Gotovina has revealed the Croatian general indicted for war crimes will try to embarrass the US if he is extradited to The Hague for trial. „If it comes to an arrest, General Gotovina’s defence team will call on individuals from the United States to testify,“ said a friend of the controversial former army commander, Nenad Ivankovic, who is head of the right-wing organisation HONOS, the Association for the Protection of the Values of the Homeland War. from left: Person Nr. 2 = Ante Gotovina + 2 US Verbrecher, welche die Ethnischen Säuberungen und Progrome in der Operation “Sturm” in 1995 kommandierten. Bis heute laufen da ITCY Ermittlungen, wo eine Anklage durch die Amerikaner verhindert wird, genauso gegen Holbrook und Bill Clinton und Georg Tenet. 2001 als die Grundlage für diese Sonderrechte geschaffen wurden, waren längst Haft Befehle ausgestellt u.a. für Kriegs Verbrechen und die Ethnischen Säuberungen u.a. in der Krainja 1995 gegen Kroatische Militärs und den Geheimdienst Ante Gotovina, der aber unter dem direkten Kommando der Amerikansichen MPRI Militärs diese Operationen nur als Befehls Empfänger leitete. Der ITCY überlegte sogar damals, das man Verfahren gegen Bill Clinton und Richard Holbrook eröffnen sollte, für die Befehls Verantwortung für diese Kriegs Verbrechen. Joschka Fischer ist willfähriger Handlanger für die übelsten Verbrecher im Balkan und Handlanger für Kriegs Verbrecher wie die MPRI, welche Hitlers Ethnische Säuberungen und Morde erneut im Balkan aufleben liess. Obwohl die Presse wie die TV Ausstrahlung des SWR, Spiegel über die Amerikanischen MPRI Verbrecher Verbindungen im Balkan sehr informativ berichteten, inklusive des Waffen Embargo Bruches, konnten die US gestützten Verbrecher Banden, ungehindert aus der US Schutz Zone im Kosovo ihre Islamischen Terroristen und Gangster Clans dirigieren und dies wie durch damals geheime Gesetzes Änderungen publik wird, mit Hilfe von Joschka Fischer, der Zeit gleich die Botschaften und Vertretungen in Tirana und Pristina der Albaner Mafia übergeben hatte.